This page describes the commands used to create, display and manipulate sprites. A sprite is a rectangular array of color/alpha values, ranging in dimensions from 1x1 upward. Perlenspiel supports two classes of sprites, solid and image. In a solid sprite, all of the color/alpha values in the array are the same. 1x1 solid sprite, gray and opaque. 3x2 solid sprite, red with 50% opacity. In an image sprite, each value in the rectangular array can have a different color/alpha value. Such sprites can be thought of as tiny images, and they can be created using data loaded or captured with Perlenspiel's Image commands. 4x4 image sprite, various colors, opaque. 5x3 image sprite, some transparency. Once created, a sprite can be displayed and moved around the grid using a handful of simple commands. When used together with grid planes, sprites can greatly simplify many engineering tasks, especially animation. The PS.spriteSolid() command creates a solid black sprite with no transparency. The required width and height parameters specify the dimensions of the sprite. They can be any positive integers. Values less than one (1) are clamped to 1. Non-integral values are floored. If either parameter is PS.DEFAULT, the value one (1) is used. See the Demonstrations section below for interactive sample code. 1. By default, solid sprites are PS.COLOR_BLACK and PS.ALPHA_OPAQUE. You can change a solid sprite's color with PS.spriteSolidColor(), and its alpha transparency with PS.spriteSolidAlpha(). PS.spriteSolid() returns a string that uniquely identifies the new solid sprite. It can be passed into any Perlenspiel command expecting a solid sprite identifier. The PS.spriteSolidColor() command changes the color of a solid sprite previously created by PS.spriteSolid(). The required sprite parameter must be unique sprite identifier of the type returned by PS.spriteSolid(). The PS.spriteSolidAlpha() command changes the alpha transparency of a solid sprite previously created by PS.spriteSolid(). The PS.spriteImage() command creates an image sprite from a previously defined imageData object. The required image parameter specifies the imageData object that will be used to initialize the sprite. The optional region parameter specifies a zero-based rectangular region inside the image that will be included in the sprite. More information is available in the API documentation. 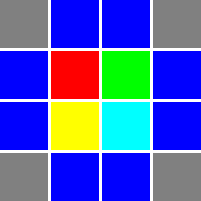 The PS.spritePlane() command changes the grid plane assigned to a sprite. The PS.spriteShow() command controls the visibility of a sprite. The sprite no longer produces collision events with other sprites. PS.spriteShow() returns true if the specified sprite is currently visible, else false. By default, the positional axis of a sprite is its top left corner (0, 0). The PS.spriteAxis() command lets you change the axis to any location on (or off) the sprite. The optional x and y parameters specify the location of the sprite's positional axis relative to the top left corner of the sprite (0, 0). They can be any positive or negative integers. Non-integral values are floored. The PS.spriteMove() command lets you place or change the location of a sprite in its current grid plane. The optional x and y parameters specify the zero-based location of the sprite's positional axis on the current grid plane. They can be any positive or negative integers. Non-integral values are floored. The PS.spriteCollide() command lets you specify a function that will be called when a visible sprite touches or overlaps any other visible sprite. 2. When you change a visible sprite's collision function, that function is called immediately if the sprite is currently in a collision state with another visible sprite. The PS.spriteDelete() command deletes the data associates with a sprite, immediately removing that sprite from the grid if it is visible. The following series of demonstrations show how the sprite commands can be used to implement common animation effects. This first demo creates a 15x15 floor of random gray beads, then creates a solid 3x3 red sprite in grid plane 1. Use the arrow/WASD keys to move the sprite around. Notice that it's possible to move the sprite completely off the grid. Here's the same demo with one line of code added, to show how alpha transparency works with solid sprites. 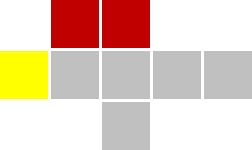 3x3.bmp, magnified to 128 x 128 pixels. Here's the same demo again, this time using an image sprite initialized from 3x3.bmp, a 3x3 image file. happy.png, magnified to 110 x 110 pixels. Same demo, using an image sprite initialized from happy.png, an 11x11 image file containing alpha transparency. One way to create "shaped" sprites. In this final demo, two solid sprites are created, a blue square on plane 1 and a semi-transparent green square on plane 2. Use the arrow/WASD keys to move the green sprite around and "over" the blue sprite. A collision function reports when the sprites touch or overlap. type = " touched "